An Indian student measuring just a little over two feet has been confirmed as the world's shortest living woman by Guinness World Records. Jyoti Amge, at 62.8cm (24.7in), is 7cm shorter than previous title holder, American Bridgette Jordan.. Ms Amge was conferred the title on Friday as she celebrated her 18th birthday in the city of Nagpur. Ms Amge has a condition called achondroplasia, a form of dwarfism, and is not expected to grow further. 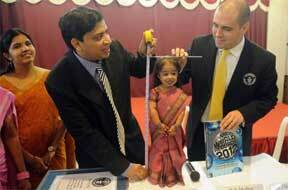 In 2009, she was named the world's shortest teenager at 61.95cm. The shortest woman ever recorded was Pauline Musters (1876-1895) of the Netherlands, who stood at 61cm. Ms Amge was presented with a certificate, watched by her parents in Nagpur. "It is wonderful to celebrate my 18th birthday with a new world record, it's like an added birthday present," she said. "I feel grateful to be this size, after all if I weren't small and had not achieved these world records I might never have been able to visit Japan and Europe, and many other wonderful countries," she said. Dressed in a traditional sari, she stood on a chair next to a seated Rob Molloy, official adjudicator for Guinness World Records, to cut her birthday cake. "In accordance with our guidelines, Jyoti was measured three times in 24 hours by a doctor," Guinness World Records said. Ms Amge has attended regular school since she was four and has just finished her high school exams. She plans to undertake a university degree. Can proteins in blood predict early death?